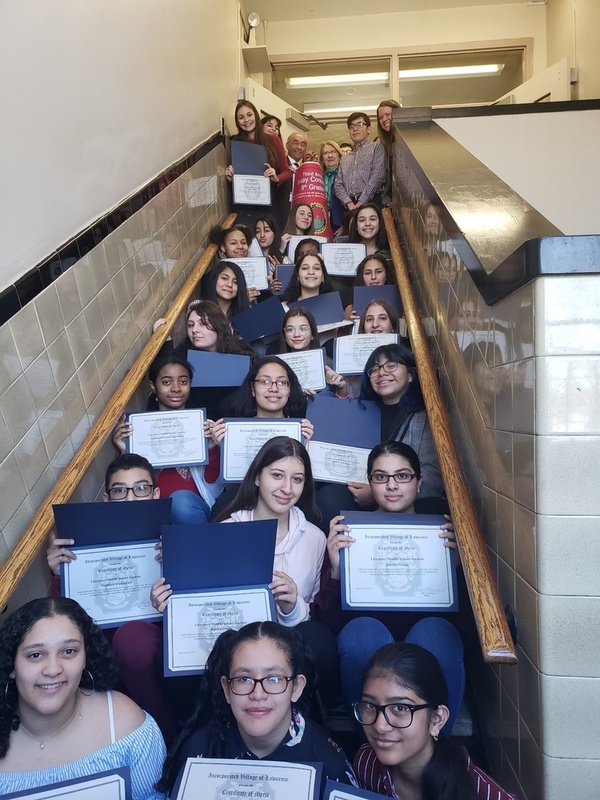 On Tuesday, March 26, Village of Lawrence Mayor Alex Edelman and Village Administrator Ronald Goldman visited Lawrence Middle School to celebrate the accomplishments of 8th graders who submitted their "If I were Mayor..." essays. Dr. Ann Pedersen, Superintendent of Schools, also enjoyed celebrating the writing of the 8th graders. Mayor Edelman shared his appreciation of the students for involving themselves through writing in civic duty. He likewise took questions from the students, such as, "What are the largest challenges as a Mayor?" and, "How much does a Mayor get paid?" Mayor Edelman shared his personal beliefs on why he became involved in politics, and his ultimate want to better the Lawrence community. Mayor Edelman and Village Administrator Goldman then awarded each student with a special certificate to honor their submissions to the essay contest. The visit ended with Principal Perry thanking the Mayor for his visit, and taking a picture with the whole group as is seen above.